This conference will focus on the experience of hearing voices, the importance of recognising all aspects of human experiences and importantly, will celebrate the contribution made by Janey Antoniou to improving mental healthcare delivery. Hear the latest psychological approaches on helping to support people who experience voices giving them commands. Contrast different approaches to understanding and helping people who hear voices. Consider the new peer support worker role in mental health services to support recovery. Reflect on art based approaches as meaningful and creative sources of support. 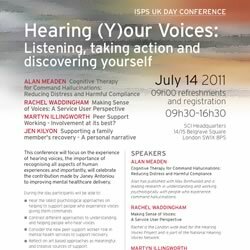 The AGM of ISPS UK will follow this Conference.